Weiss Powers into Top 10 Bike and 16th Overall at Ironman World Championships With the sun just peaking over the horizon at exactly 0630 on Saturday 10th October 2015 and the temperature already nudging 26C with 80% humidity, the canon sounded to mark the male pro start of the Ironman World Championship in the bay of Kailua-Kona. We knew then that it was going to be a day of attrition. Who would best be able to put together equally strong swim, bike and run splits while being cooked alive? If ever there was proof needed that while triathlon is made up of three disciplines it is but one sport and the cumulative fatigue, especially in Ironman distance undertaken in great heat, needs to be very carefully managed by the successful athlete whether pro or age grouper as if not, the day will be a short one as many of the big names found out. 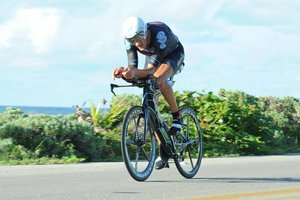 Indeed, the eventual winner, Jan Frodeno, described the race as “like being locked in a sauna that also happens to have a wind tunnel in it”. The ‘Kona Code’ is a truly unique challenge, which requires real experience to crack. Q&A with trainer Josu Larrazabal: How TFR utilizes its SRM PowerMeters during a Grand Tour like the Vuelta Look closely at any of the Trek Factory Racing sleek red Trek bikes and you will see centered on each handlebar a red, square SRM headunit – a mini-computer dashboard so to speak – and eying each crankset you will notice each one fitted with an SRM Shimano 11-Speed PowerMeter. Power meters are not new to the world of cycling, training and racing with this technology has been around for roughly 20 years already, all thanks to its creator, SRM. The German engineered SRM (Schoberer Rad Messtechnik) was the first crank-based power meter and pioneers of the science behind power-based cycling. 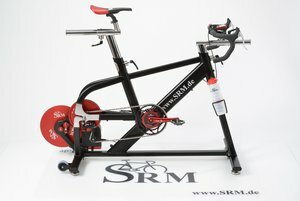 SRM first established in 1986, but due to its initial high cost did not make its way to the general cycling communality until mid-1990, and since then power-based training has exploded. 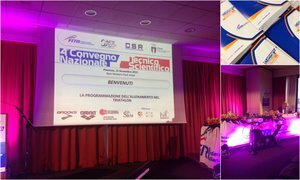 Where once training and racing with power meters was seen only in the pro ranks, today it is the normal standard for most competitive cyclists, from amateurs to pros. Trek Factory Racing is continuing its partnership with SRM through 2016, and we wanted to know more about how Trek Factory Racing utilizes this cutting-edge technology, specifically in a grueling race like a three-week Grand Tour. A few days after the Vuelta finished we cornered director and trainer Josu Larrazabal to drill him with a few questions about the Vuelta, the SRM, and just what the heck the team does with all the data it collects. 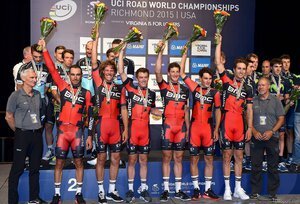 Richmond, Virginia - The BMC Racing Team led through every time check Sunday on the way to capturing its second straight UCI world team time trial championship. Powering its BMC timemachine TM01s through the streets of Richmond, Virginia, the BMC Racing Team averaged 54.969 kilometers an hour to best Etixx-Quick Step by 11.35 seconds. Members of the winning team were Rohan Dennis, Silvan Dillier, Stefan Küng, Daniel Oss, Taylor Phinney, Manuel Quinziato. SRM is the official power meter sponsor of the BMC Racing Team. The team trains and races with the SRM Shimano 9000 Training System.